Earlier today, Mr Trump described the Taoiseach as "my new friend, a great guy" and said he will visit Ireland during his presidency. Mr Trump spoke only briefly while in the presence of journalists to confirm that he "absolutely" intends to visit Ireland. "I'll be there for sure," Mr Trump said. Asked whether an invitation had been extended to the president, Mr Kenny said he could come "during the course of his presidency". A reporter asked whether the president had raised previous comments about Mr Trump's language being "racist and dangerous" but both leaders ignored the question. At an event at Capitol Hill today, Mr Kenny congratulated President Trump on his election. 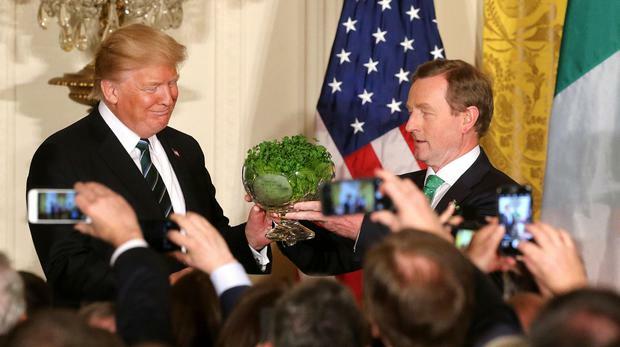 "I would like also to congratulate President Trump on his election and to thank him for so graciously agreeing to attend this event, continuing this great tradition which goes back to the era of Ronald Reagan and Tip O’Neill," Mr Kenny told those in attendance. "We have not yet identified any Irish family roots of the President, but we are working on that. But he does have an Irish connection through Doonbeg in beautiful Co Clare. And I very much appreciate his taking the time to join us here today. Thank you sir." He also used the opportunity to address US immigration reform, but said he it was not his place to "insert myself into your political debate". "As you know very well, immigration reform is of great and real concern to Ireland and an issue I have raised on a regular basis with you and your predecessor. This is a matter of reform of a system that affects many nations," he said. "It is not for me to insert myself into your political debate but I would highlight the plight of our undocumented community of up to 50,000, hardworking Irish men and women, who are tax-paying contributors to this, their adopted home. "Many of them came here decades ago in a different era, and have been caught in limbo without any path to regularise their status. On this day when we remember St Patrick, himself an immigrant twice over to our shores, I urge you to look sympathetically at this issue." "That’s a separate matter from being able to do a bilateral deal with Ireland in the same way as applies to visas with Canada and Australia." Mr Kenny also spoke about Brexit and the importance of protecting the Northern Ireland Peace Process. He also defended the European Union, against the backdrop of President Trump's ongoing criticism of the union. "Membership of the European Union has been transformative for Ireland’s economy and society. Ireland has always been a fully participating member. That will not change," he said. "The European Union is, above all else, a community of nations built on shared values – these values include human dignity, freedom and democracy, equality, and the rule of law. "Values that I know are shared on this side of the Atlantic. "I firmly believe that the EU can and will continue to be a force for good on the global stage. Ireland and Europe will never be the enemy of the United States," he said. While he referenced Ireland's economic growth and the importance of Irish firms in the US he did not address the issue of taxation. He also did not address the issue at an earlier meeting in the Oval Office.